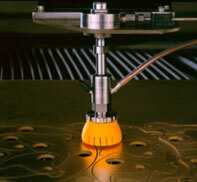 Waterjet cutting provides superior edge quality with minimal secondary finishing. Ability to cut various range of thickness & materials, i.e. Stainless Steel, Inconel, Duplex, Aluminium, Brass, Naval Bronze, Bronze, Copper, Polypropylene(PP) & other alloys. Superior edge quality eliminates costly secondary finishing. Abrasive waterjet is a cold cutting process that cuts with erosion, rather than shearing or heat, so they produce exceptional edge quality without inducing heat-affected zones or mechical stresses, thus allowing raw materials to maintain their structural integrity.